It has been TOO long since I have posted anything here on One Lucky Day! Preparations for Creativation (the new name for CHA) took front seat in November, December and most of January but I hope to get back on track with regular posts now that I have returned home from Arizona. I thought it might be fun to see how we gather and use props for the show (a little behind the scenes magic). Back in December, Mario, Tim and I took a little junkin trip down to Phoenix to shop at a few antique stores including the wonderful Sweet Salvage. 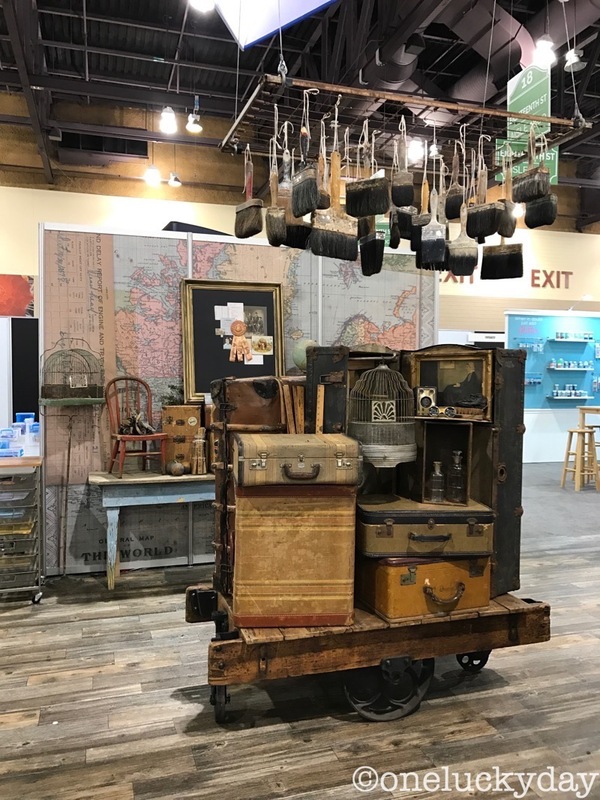 Our goal was to find props that would fit with our idea-ology show booth - did we find them? We sure did! Tim spotted this dresser with absolutely stunning crackled paint for the "masculine" side of the booth. It was missing handles on the top drawers but that was an easy fix. We also spotted a couple of old trunk liner boxes, large wood crates and the frame from an old mirror (can you spot it in the display above?). 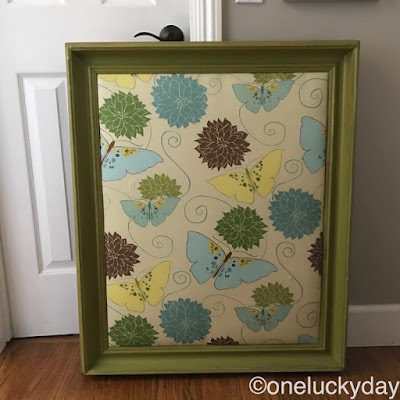 It worked to frame out two samples made by Tim and Kaz Hall. 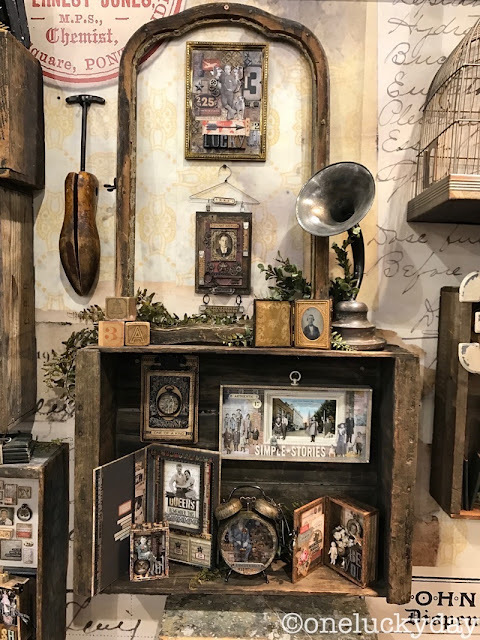 We had Art (Tim's handy neighbor) add a barn wood shelf inside each box for display. You'll notice that the striped twill handles and ties were left in tack (that was my favorite part). 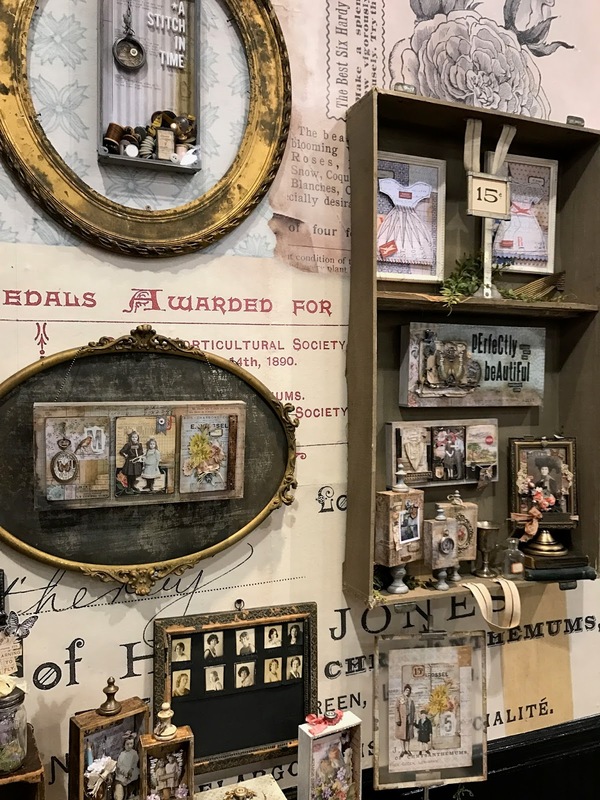 We needed some gold to add to the "feminine" side of the booth so I gathered old frames from my collection to add to the wall. 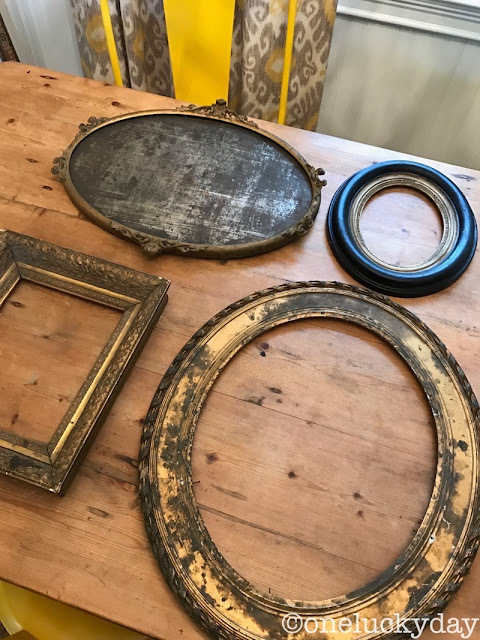 A huge shout out to my favorite TX antique dealer Pocket Full of Heirlooms for the fabulous gold frame with the tin center (as well as a few other pieces like the pink prize ribbon). I bought it a few months back and knew I wanted to use it for the show. So glad it worked out! 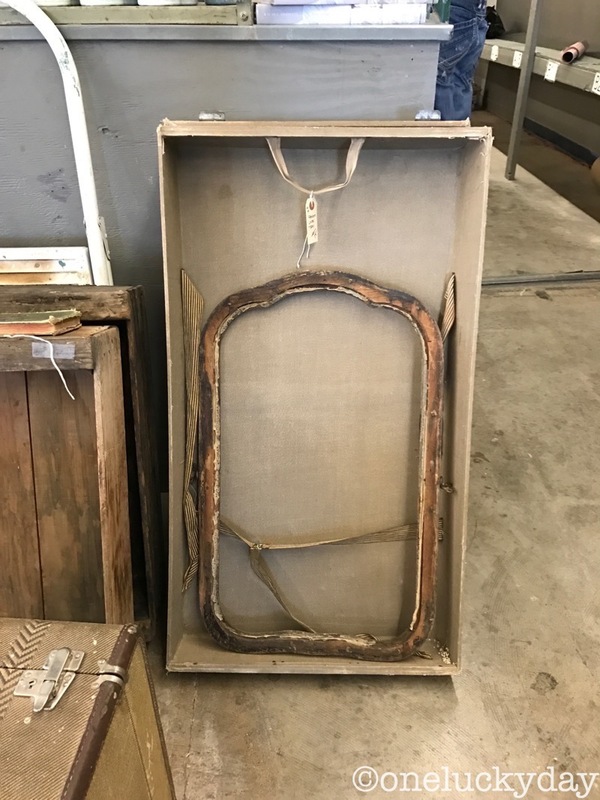 You might notice the smaller frames in the tray liners had to be moved to accommodate the samples, but no matter, they were used in other places in the booth. The shelves worked perfectly for the samples and the gold frames worked to showcase a couple pieces that I will share another day. 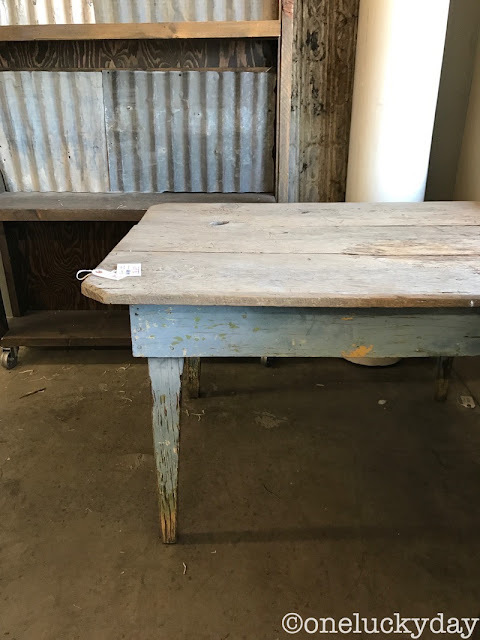 We also ran across this farm table that was shoved off into a corner...we needed something big for the back wall but would this do? Much too wide for what we needed but it had the right patina. We searched for other pieces and then came back to it...the blue legs sold us. This is how we made it happen. Art split the table in two and braced the two pieces together. It could not have fit better! I have just one more transformation to share...do you recognize it? 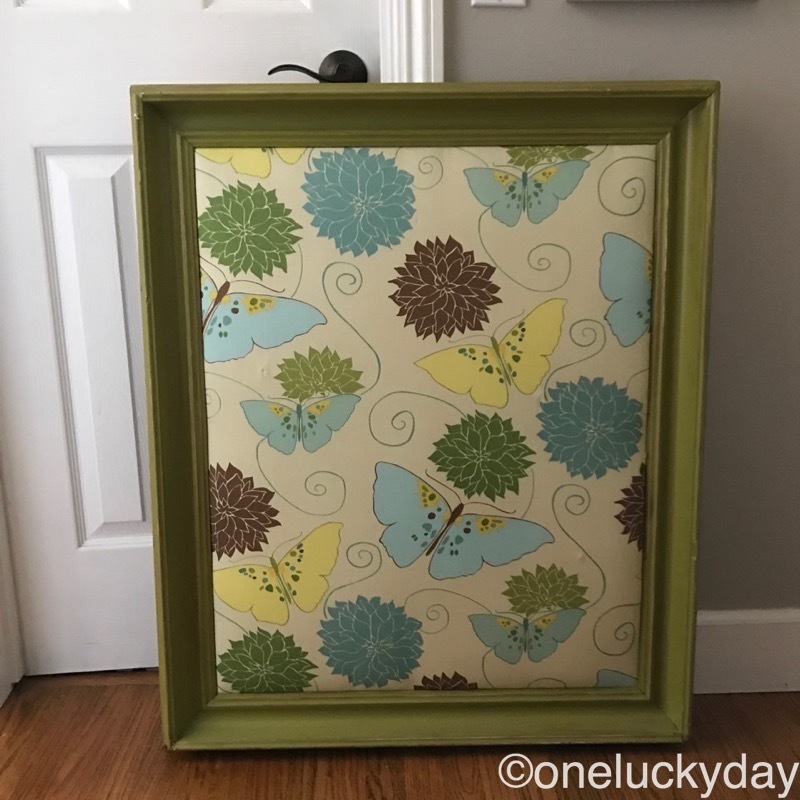 Well, this is how the large frame looked before my husband cut a new wood center and painted it with chalkboard paint. He spray painted the frame gold, then I gave it a faux antique finish with some black paint. Quite the transformation! But so PERFECT for the booth! Seriously why has it been sitting in my attic for 3 years? Well, I sure hope you have enjoyed this little behind the scenes tour of the idea-ology booth. 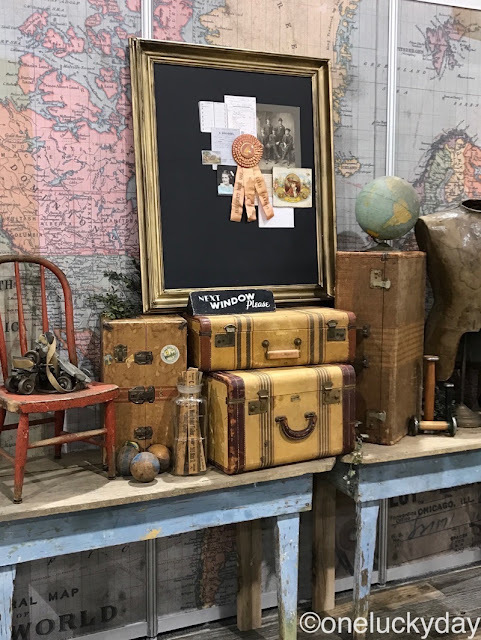 Hopefully there are some ideas here that might spur your own vintage look at your home. Don't be afraid to adapt the piece to what you need or even cut it in half to make it work! Just go for it! 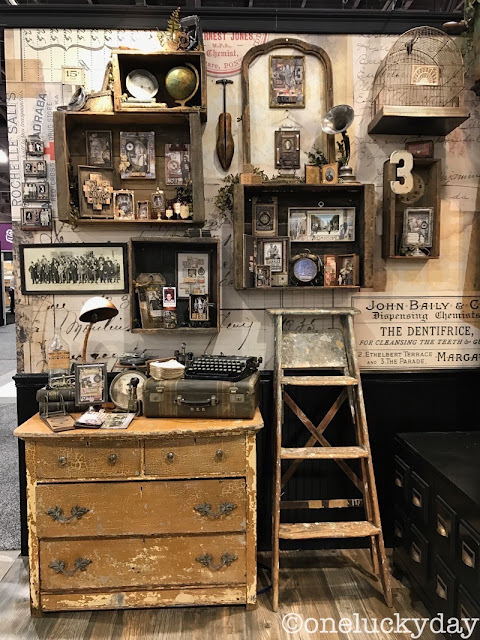 If you are interested in seeing more of the booth, Tim's recap can be found on his blog - the post has more pictures of the booth and many of the projects. I love the look of the booth. 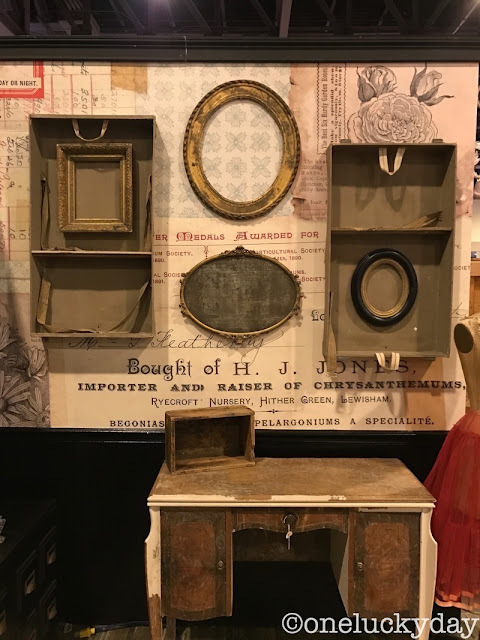 Repurposing old furniture and other antiques is much more interesting than slick new display cases, IMO. 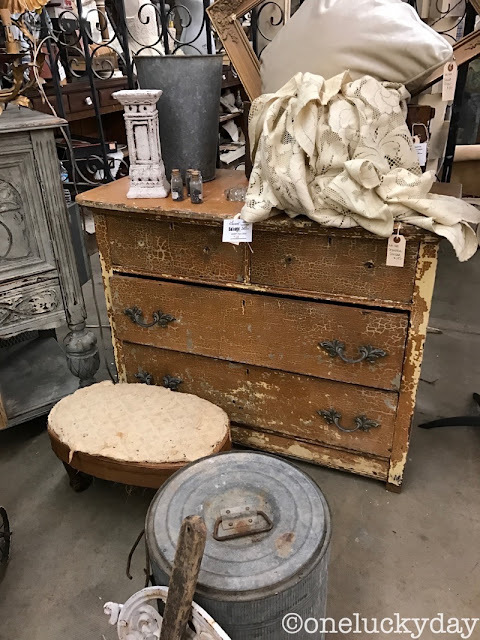 I've not had the pleasure of going to Sweet Salvage, but I told my mom about it (my parents winter in AZ) and she and her friends have gone a few times. She bought me some small art goodies like vintage tart tins. an amazing transformation! And that ugly green frame turned out to be a real beauty! I enjoy the masculine side and feminine side of the both - a great way to showcase the versatility of idea-ology! Now do you want to come to my house and transform it??? Looking forward to seeing more projects on your blog - I've been missing your creativity! thanks Kat! Appreciate the kind words. I will start posting projects next week on the blog. Determined to be more "blog" present from here on out! 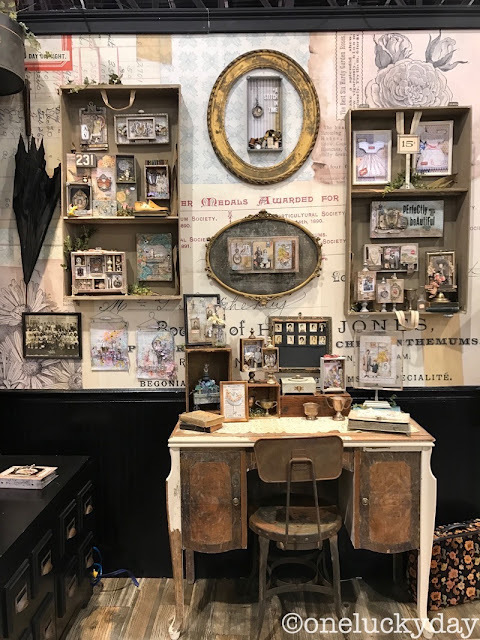 I can't tell you how much I enjoy and look forward to seeing the Tim Holtz displays each year. Thank you for sharing as it is so, so interesting. You guys do the best job and the projects are always just magic. I wish we could get more closer ups of more of the projects, they are always so inspiring. Always fun to see the booth! Love seeing all the different perspectives from everyone. The booth looked wonderful and the samples were amazing (once again). You guys always pull it all together so nicely! Thanks for sharing Paula! thanks Redanne - glad to share our vision for the booth! 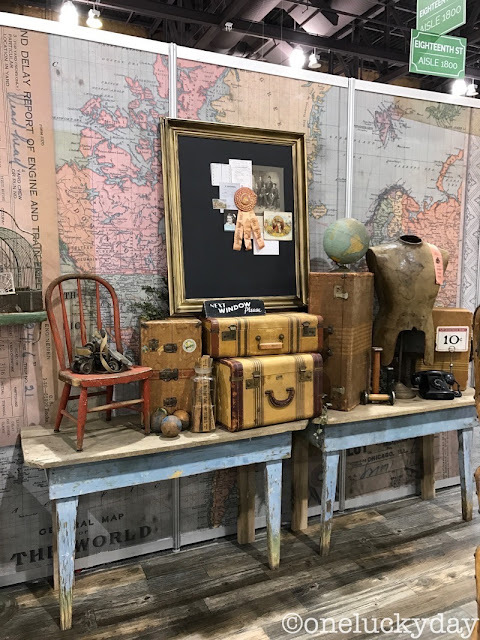 this is a feast for the eyes..full of vintage goodness ! it always makes me feel inspired and eager to get my hands on the new goodies ..the booths are always such a treasure trove of delight ... and you all do such an amazing job!! Thank you so much for the BTS glimpses! the frames, the tables, the little vignettes... sigh... I really wish to see it all in person sometime! Another piece just caught my eye from your photos - "a Stitch in Time" - who designed that? LOVE IT! and surrounding it in a gold frame! WOW. Thanks for ALL your hard work! Hi Corinne - I designed that project! I will be sharing it on the blog soon! Fantastic! I love all the before and afters! Thanks for sharing the ideas behind the marvelous Ideaology booth displays. It's always my favorite booth at the show. This is probably my favorite post each year. I just LOVE to see what you do behind the scenes as well as seeing the booth when it's completed. Awesome! This was fun to read!!!!!! I loved this BTS look!! !